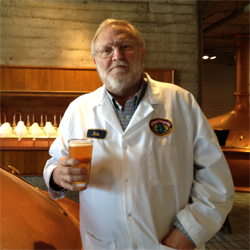 Bob Brewer answers your questions about the world of beer & brewing. Marteinn (via Facebook): Hi there , may i ask where you get your bottles? I really like them and i want to use similar bottles for my future small brewery. Thanks. Bob: Our bottle story has a few interesting twists to it so I thought a bit of history on the subject might be in order. The Anchor Brewing bottle from necessity to signature package: Where, When, How, and Why. 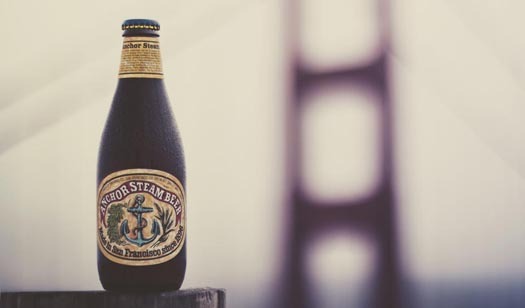 When Fritz Maytag decided to start bottling Anchor Steam Beer in 1971 there were a few issues to consider beyond just the mechanics of beer packaging. One of the major concerns was which bottle to use and where to get it. In 1971 there were basically two different styles of beer bottles available in the USA, with a few proprietary variations used by some breweries. These were the returnable and the non-returnable varieties. One basic style was what we now refer to as the “long neck,” which was a 12-ounce returnable, re-fillable heavy duty bottle primarily used in bars. The long neck was also a common bottle in that it was used by almost all of the big breweries of the day. The empties did not have to be sorted by label since they were all the same and were returned based on the carton labeling rather than that of the bottle. In some markets there was a shorter, fatter returnable bottle which was known as the “stubby”. Stubbies were used mostly in the Eastern U.S. and Canada and also contained 12 ounces. For the take-home trade, the non-returnable bottle was the norm by the early seventies. Breweries had begun to design signature packaging with unique styling and embossing to identify their products in the broad market. Since those bottles were non-returnable, commonality was not an issue. Where does this get us with Anchor bottles in 1971? We had few choices. The returnable was not an option because we were far too small to engage in the process of collecting and washing them for re-use. Using a returnable as a non-deposit wasn’t an option either because of the cost of the heavier duty refillable glass was too high. Having a glass manufacturer produce a signature bottle for us was also not a viable option because we would have had to buy a year’s supply all at once just to make a minimum order. Mold design and set-up costs also had to be figured in. There was, however, one other approach. The major glass manufacturers had a few generic designs of their own that they would produce for breweries that didn’t see the need for proprietary bottles but still wanted something other than the standard stubby. We still couldn’t come close to a minimum order, but there was a large Hamm’s brewery in San Francisco back then, in fact only a few blocks away from Anchor, that used one of these bottles. Fritz was able to buy small amounts of this glass from them to get us started. Our labels and likewise our labeling machines, filler, and case packer were designed and configured for the bottle shape. We were in the bottle business. Over time, as we grew larger, we were able to buy minimum orders directly from the glass manufacturer. However, also over time, the few other breweries that had been using this bottle either stopped doing so or went out of business. Somewhere along the line Anchor Brewing became the only customer for this particular bottle and the glass manufacturers were going to discontinue it. We liked the bottle shape and since all of our packaging and labeling machinery was designed around it, we decided to stay with it. In effect this once semi-generic bottle that we had adopted out of necessity had become the signature package for Anchor. To insure a continued supply, we bought the design and the molds and arranged to have our glass custom-produced as needed. Today we are large enough to order full production runs and enjoy an economy of scale that allows us to continue to use a beer bottle that is now unique in the industry. So there you have it. A small – really small – San Francisco brewery wants to start bottling and ends up getting their glass from a large brewery nearby. When everybody else stops using that particular bottle and the glass factory stops making it, they buy the molds and design and start having it custom manufactured to order, thus inheriting a semi-generic design that has now become a signature package for them. As to the question of the availability of this bottle, Marteinn, the answer is since Anchor Brewing owns the molds and has the glass specifically produced for its own use, this bottle is not available on the commercial market. Thanks for your question and good luck with your brewery! I’ve just been made aware, by Bob Brewer’s informative article, that the discovery of my favorite beer at Cow Hollow (Union Street) in San Francisco and a little later as a member of one of the Department of Public Works Land Surveyor crews visiting your Ninth St. brewery (after our day’s work, of course) all took place in 1971. So, l guess, we’ve grown up together. It’s my understanding that Teresa’s desire to seek employment with your firm stems from my claiming that it was, and still is, my favorite beer. Whether or not my understanding is correct on that, I’m proud that we both can associate with a flavorful product that is so deeply entrenched in it’s historic western background. Thanks for bolstering our pride in our wonderful home town. P.S. I remember that Theodore Hamm’s brewery where Fritz acquired his first glass.